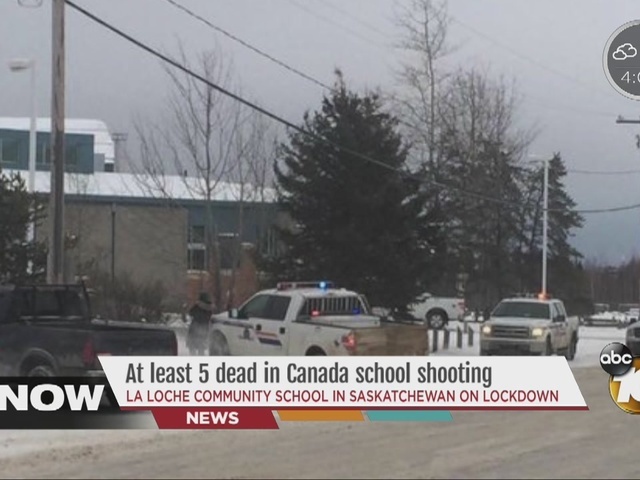 A gunman opened fire at a high school and a second location in an aboriginal community in northern Saskatchewan on Friday, leaving five dead and two others critically injured, Canada's prime minister said. Prime Minister Justin Trudeau said from Davos, Switzerland that a suspect was in custody. "This is every parent's worst nightmare," he said. "The community is reeling." Kevin Janvier told The Associated Press his 23-year old daughter Marie, a teacher, was shot dead by the gunman. "He shot two of his brothers at his home and made his way to the school," he said. Marie was Janvier's only child. He said he didn't know if the shooter knew his daughter. Trudeau said the shootings occurred at a high school and another location but did not release any information on the second location. School shootings are rare in Canada. A student who was just returning from lunch when shots were fired said his friends ran past him urging him to get out. "There's a shotgun! There's a shotgun! They were just yelling to me. And then I was hearing those shots, too, so of course I started running." The grade 7 through 12 La Loche Community School is in the remote aboriginal community of La Loche, Saskatchewan. The school's Facebook page said it would remain on lockdown until the Royal Canadian Police resolve the matter. It asked the public to stay away. It was unclear how many died at the school. Police have yet to announce any details. Saskatchewan Premier Brad Wall earlier confirmed the shooting. "Words cannot express my shock and sorrow at the horrific events today in La Loche. My thoughts and prayers are with all the victims, their families and friends and all the people of the community," he said in a statement. The area's representative in parliament, who attended the same school, was setting up a constituency office in the community when the shooting occurred. "We're fairly shaken up. It's a sad day," said Georgina Jolibois, who was mayor of La Loche until she was elected to parliament last fall. "My own nieces and nephews were inside the school." Jolibois said she went to the school and spoke with some of her family members, who were unharmed. She wouldn't reveal details of the shooting, saying she preferred that police release the information. Bobby Cameron, Chief of the Federation of Saskatchewan Indian Nations, said it was the worst tragedy to ever hit the community. "It's not something you ever imagine happening here. The whole community, province and country has been affected and we will all go into mourning," said Cameron, who attended graduations at the school for the past few years. "Right now we're just in a state of shock and disbelief."